I read about you in the Wall Street Journal two years ago and couldn’t help but notice a number of resemblances. The philosophy professor who wrote about you taught at Calvin College in Grand Rapids, Mich.? I graduated from Calvin! Did our time overlap? How did I not run into you? Two years ago, your professor wrote to you as a rising sophomore. Let me write to you as a rising senior now. I hope this letter finds its way to you. This professor described you as a once-promising freshman who stopped learning and instead decided to “settle for ideology.” Ouch. He said, “Now you seem more intent on unmasking ‘micro-aggressions’ and detecting colonial prejudice in a canon that you increasingly disdain.” Damn. Maybe it was actually better your name was left out. I can only imagine how tough it’d be for me to have one of my teachers write this about me. His letter tried to paint your concerns as invalid and trivial at best. Even if you can still hear that rebuke in the back of your head, don’t let it deter you. You were very young. It may take even more time and reflection for you to realize the profound ways in which your instincts were right. It’s not surprising you’ve gotten yourself in trouble. This is the fruit of epistemological disobedience. Here’s the thing: For people like us, there’s a way we’re expected to act in predominately white spaces. They like us as long as we smile and talk “reconciliation.” But when you start acting like you can think as one of their equals? It’s the equivalent of a revolt. Dare to theologize and define your spirituality in ways that they don’t like? It’s heresy. It’s not surprising you’ve gotten yourself in trouble. This is the fruit of epistemological disobedience. I’m writing this letter in a spirit of comradery and because I want to encourage you. Your story has stuck with me. Perhaps one day I can hear from you and also learn from you. For now, I’m just trying to share some of what I’ve learned. We often feel that something is wrong before we have the words to describe it. That was definitely my case. I learned about Aristotle’s virtue ethics, Augustine’s political theology, Kant’s categorical imperative, Heidegger’s Dasein, Kuyper’s Calvinism, Wittgenstein’s language-games, Simone de Beauvoir’s feminism. It’s not that this was all bad or unhelpful, but it only told a partial story. For example, I once noticed what Hegel said about black people in the assigned reading for a class. It disturbed me. It seemed to me like an important problem if we wanted to understand this thing called “modernity.” But we didn’t discuss it. What Hegel (and Kant, and others) said about various peoples of the world was construed as secondary. I glimpsed the limitations of how western thought thought about itself. To be fair, there were always some professors who were aware of these limitations. I was fortunate to find teachers who made room for other voices and questions. And that’s the best you can do sometimes. Don’t necessarily expect your allies to look like you or look some particular way. Find the teachers who respect you and allow you to follow your questions. Frantz Fanon has a famous prayer at the end of Black Skin, White Masks: “My final prayer: ‘O my body, make of me always a man who questions!’” If people want to reject the prayers that arise from your body and your experiences in this world, then find other people to pray with. The uneasy feeling in my gut that something was wrong was connected to a silence about an ongoing legacy. These systems of thought, as presented to me, sat on top of open colonial wounds. Somehow – and I’m not sure if I fully understood – this history was connected to my protests against institutional racism in higher education. This history was also connected to my questions about being an Afro-Latino in the U.S. I heard many Christians say that every human being is created in the image of God. I quickly realized that this was a lie. Consider how some talk about the universality of Christianity. The gospel itself is said to be “universal, needed to be contextualized across human cultures.” It just so happens that the “best” theological interpretations of the gospel have come from European men (and maybe some pre-modern figures, as interpreted by European men) – but don’t worry. You can still have an important role as a “translator” and “indigenous leader” who contextualizes the pure gospel to colorful local contexts! You are starting to see through this. The reality is that modern Christianity in the Americas was built upon the genocide of indigenous people, the theft and commodification of land, and the enslavement of black people. It wasn’t simply an ethical glitch of bad people with otherwise good theology. No. This was praxis, linked with liturgy, linked with worldview, and, beyond that, to imagination. Will you continue to believe that modern “Christianity” is essentially good but was simply misused by bad people? Or, will you have the unflinching courage to critically examine Christianity’s role in horrors, in inequality, even in your own alienation? I’m not pressing you to give up faith. God and Jesus do not have to be equated with the theological and ecclesial edifice that justified the conquest, the reservation, and the plantation. But you will have to make tough decisions. Diversity and inclusion within oppressive systems can be celebrated as ends in themselves. Many want to diversify the personnel of Christendom without a deeper reckoning of what has occurred. I’m not pressing you to give up faith. God and Jesus do not have to be equated with the theological and ecclesial edifice that justified the conquest, the reservation, and the plantation. But you will have to make tough decisions. This professor claims you’ve given up learning for ideology. Don’t let this distract you. You can never win the game of proving you’re smart enough or rigorous enough or orthodox enough or whatever. The fact is, you do want to learn. 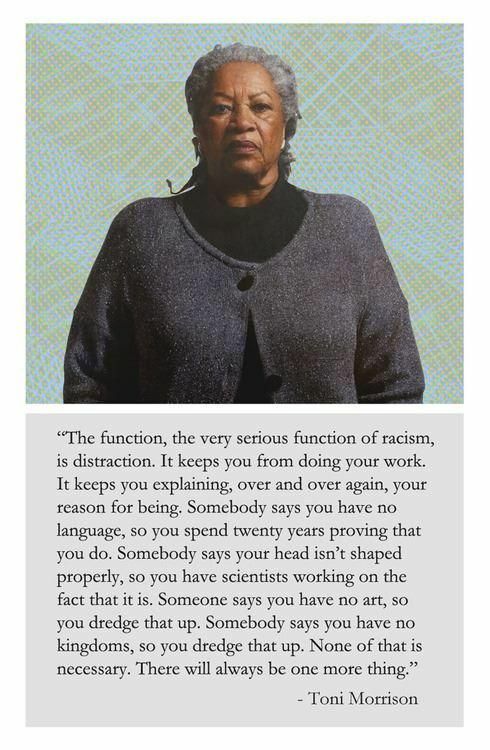 But it goes beyond some simple desire to construct a jingoist history – what Toni Morrison describes as the distraction-function of racism. But of course you are seen as ideological when you raise these questions. Your passion for social justice gets interpreted as a form of “advocacy” that’s incompatible with the intellectual life. You know what’s funny about this? When professors who say this go do work associated with a conservative think tank, it’s suddenly not advocacy – they are just thinking and working for the renewal of social life. And when these professors spend a considerable amount of time gathering with other white men, reading books and entertaining the anxieties of other white men, it’s not “me-search” or identity politics in any form. I hope that you can always remain open to self-criticism. We can be marginalized and complicit. Both can co-exist. The goal should be for everyone to get free – including oppressors, which sometimes includes ourselves. We shouldn’t stop at personal advancement and inclusion in society as it is. Our identities can be windows for imagining different worlds. Your struggle can expand the borders of your compassion and give you the tenderness needed to be in solidarity with others. Something else you will grow to realize is that their fights are not always your fights. Sometimes they will ask you, “Are you on Side A or Side B?” when really you need to be figuring out Side C. This professor says he understands “the joyride of liberal enlightenment” that you apparently are on. This merely shows that he’s trying to define you within his limited terms. You are looking for something beyond liberalism, which itself is caught in these problems. Eurocentric knowledge is circular like this. They have read too many of their own books, attended too many of their own conferences, heard their own voices too much to really see or believe others. That’s why whiteness can be described philosophically as a problem of solipsism. Does anything truly exist – have integrity, reflect the good, true, and beautiful – apart from the centralizing gaze of whiteness? As you come to a greater awareness of these things, it will be frustrating. But keep pushing. Don’t let this professor or anyone stop you from raising your questions. It’s not easy because these topics force you to confront what we all have internalized. As Gloria Anzaldúa put it, "Pero es difícil differentiating between lo heredado, lo adquirido, lo impuesto." Has anyone seen the promising freshman from three years ago? I see you. You give me hope and inspire me. I’m excited about what the future holds. There’s so much more to learn and to do. We’re just getting started.